Regular club meetings are held on the 4th Wednesday of each month at Magic's Pizza in Selah at 7:00pm. April 14 - 55 Years of Mustang to See the Bullitt - LeMay Car Museum, Tacoma. April 27 - Spring Opener Car Show, Benton City, WA. May 11 - Zillah Community Days Parade, Zillah, WA. May 11 - FOE289 Open Car & Motorcycle Show Yakima, WA. Selah Community Days parade, Selah, WA. 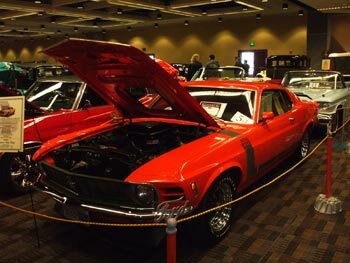 May 25 - Moses Lake Classic Car Club Car & Bike Show, Moses Lake, WA. June 1 - URock Classic Car Show Kennewick, WA. June 1 - Cruizin for Hospice Ellensburg, WA. June 8 - Show and Shine Richland, WA. 15th Best Rod Run By a Dam Site Grand Coulee, WA. September 14-15, 2018 - 28th Annual Ponies in the Sun Sarg Hubbard Park, For more info: (509) 494-3210. 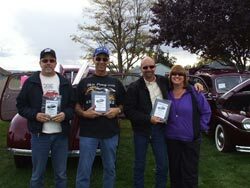 Visit our Facebook page for more pictures showing our participation in these great Central Washington car shows! Lonnie, Claude and Mark made it over to the west side for the 4th Annual Props and Ponies show at the Heritage Flight Museum. Mark attended the “cruise” on Friday, which was much tamer (slower) than in prior years, in large part due to a bicycle event using much of the same route on the scenic Chuckanut Drive along the coast. Safety concerns brought the ponies to a slow 10-15 MPH (and even a stop on occasion) on that twisty road. The bicycles separated the group and Mark took a wrong turn (along with the 10 cars behind him who followed) coming into Bellingham. Oh well, we eventually all got back together and continued winding up at the new venue this year at the Port of Skagit Airport. It was not nearly as cramped as the Bellingham Airport venue, but there were mixed reviews with some liking it and some missing the larger more busy airport. On the bright side, there was far more room so if the show is there again next year, there will be room for another 25 or 30 cars. 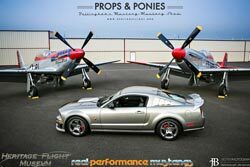 As before, every car in the show got a professional picture taken with a pair of P51 Mustang aircraft. There were 3 P51 Mustangs flying during the show, as well as an assortment of other WW2 and older vintage aircraft. The weather was over-cast, which was nice so it did not get too hot. This show had a lot of competition for the new cars, with less than a quarter of the 100 cars there being the classics (pre-73). Just some encouragement for some of you with classic cars to attend next year and take a trophy home!!! The competition among the newer cars was tight, with Mark barely getting a 1st in his class and Lonnie and Claude both being edged out by others. This show should be on every member’s “bucket list” as a show to attend. On Thursday night (18th) they have something special planned, such as a dinner or a water cruise. On Friday (19th) there is usually a Pony Trails. At one time, and it might still be, the largest pony trails in the nation. 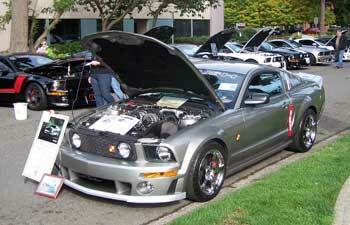 On Saturday (20th) there is a car show in which the cars are judged by The Mustang Club of America standards. There are different categories so your Mustang does not have to be concourse correct to be judged. On Sunday (21st), this is a very large “regular” car show except for the fact that there might be 1,500 cars present. Every year is different so please check the web page and again do yourself a favor and put in on your bucket list. This show is in beautiful Port Orchard, WA. You end up parking overlooking the bay. In the past they take a picture of you and your car as you arrive (so try to have you car cleaned up some prior to your arrival). This photo has been used in the past as being mounted on any trophy you might win. If you don’t happen to win a trophy you are given this picture to keep. The host group use to vote, but they don’t do that anymore. Usually the older Mustangs are parked on one side of the parking area and the newer Mustangs are parked on the other (two different sound systems, one with the oldies playing and one with some of the newer songs playing). Poker walk in the downtown businesses is enjoyable and they are glad to have you around. 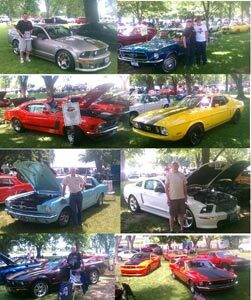 Six of our club members made the trip to Richland for the 33rd annual Spring Mustang show at Howard Aman Park on Sunday May 26. It is put on by Pacific North West Mustang Club. Those attending were Richard Rettig and his wife, Dave and Marci, Heinz and Doris, Ray, Lance, and Jeff. One other club Walla Walla, I think, had more members attending. The Richland club put on a good show as usual. They honored veterans with a color guard and the National Anthem. The weather didn't cooperate very well. It rained all through the show until about an hour before the awards were presented. Then the sun broke through and it warmed up some. Lance, Doug and Amy attended this show. It is mostly for the hot rods, but it was for a good cause. The town closes off two blocks of their downtown area and the cars and people looking at them have the run of these streets. The show is also combined with the Ellensburg Farmers’ Market. It was a nice day with just enough wind to keep the temperature just right. There was a good turn out for our first scheduled cruise in held at Peppermint stick in Union Gap. The wind had blown all day, but it finally died down a little in the evening for the event. It was still too cool to spend any time outside with the cars so we enjoyed our time together inside with our choice of refreshments. New members, Steven and Carolyn Redmond were in attendance. 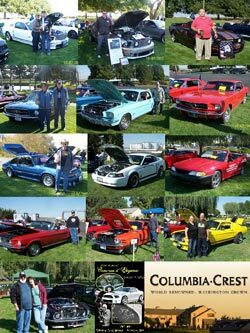 On Sunday, October 7, 2012, a bunch of us went to the PACIFIC NORTHWEST MUSTANG CLUB’s 26th Annual Concours d' Elegance at the Columbia Crest Winery in Paterson, Washington. It was a great day and although a little cool first thing in the morning, the rest of the day turned out really nice. There were 171 cars and other vehicles at the show. We were able to field 13 cars from our club, but still were not the largest club in attendance, as the Mustang Wranglers from Oregon had 15 cars. In attendance with their cars were Jeff Waidner and his 65 Coupe, Judy Mangum and her 65 coupe, Bill Hinman and his 68 convertible, David & Audrey Haynes and their 67 coupe, Richard & Vicki Rettig and their 70 Boss 302, Fred & Kathy Miles and their 69 coupe, Harold & Mary Clark and their 67 fastback, Lonnie Epperson and Amelia Epperson and their 89 fastback, Lance Sontag and his 02 GT coupe, David Hawkins and 9? coupe, Ray Fletcher and his 05 GT convertible, David and Marcy Mitts and their 07 Shelby, and Mark Sires and his Roush P51. We did well on pulling trophies. Jeff took 3rd with his little blue Mustang coupe (with Bull’s Eye riding shotgun), Bill took 1st with his red convertible, Richard took 1st with his Orange Boss 302 (after having a bit of a hard luck day getting to the show), Lonnie took 3rd with this blue Fox body, Lance took 3rd with his white GT Baron, Ray took 3rd with his convertible, Mark took second with his Roush, and finally Harold and Mary took 1st with the Yellow 67 (even if it had no seat and Harold drove it in sitting on a pillow). Competition was fierce, with Jeff, Harold & Mary, Ray, and Mark all having 8 or more cars in their class. As always, the winery grounds were a great place of the show and a good time seemed to have been had by all (with a little help from the wine tasting room!!!). Annual fundraising event hosted by Heritage Flight Museum, featuring Ford Mustangs and North American P51 Mustang! Mission: Celebrate "the car that changed the way we drive, and the aircraft that changed the course of a war”, and raise funds for the Heritage Flight Museum. 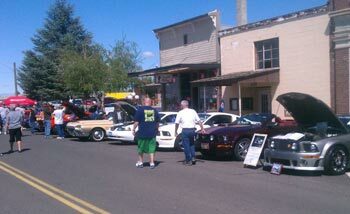 The 1st annual Sun Country Mustang Club Show & Shine at Naches was a success! The club met at Bi-mart at 8:30 am and followed Al Brown of the Yakima Greenway to the beginning of the west 3-mile stretch of the Greenway path that ends in Naches. The PT Cruiser Club had offered to help us with the show so we let them follow BEHIND us down the pathway. Normally cars are not allowed access to the Greenway but because we were hosting the Show & Shine we were given special privilege. We had about 20 cars participate in the cruising of the pathway. The cars then lined up in down town Naches on both sides of the creek under some big old shade trees and kicked off the beginning of the Show & Shine. We had 40 cars total, not bad for a first time event. There were food vendors and Apple Bin Races to entertain during the show. Awards were given at 2:00 pm. There were five categories, four voted by participants and one awarded by the Mayor’s appointee. The Upper Valley Rally was a first time event created by the Naches Valley Chamber of Commerce, The Yakima Greenway and the Town of Naches. 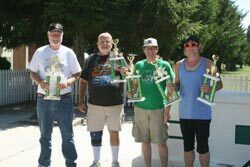 The purpose was three fold; to bring awareness of the effort to complete the Greenway Path from Naches to 40th Ave., to entice spectators and participants to come see what Naches and their businesses have to offer and to have a great time doing all the above! The three entities mentioned above would like to thank the Sun Country Mustang Club for stepping up and helping make our 1st Annual Upper Valley Rally a success. I would like to especially thank Lance Sontag for running the show; we couldn’t have done it without you! Richard Rettig’s car at the show, held at the Yakima Convention Center. This is just a short clip of the great entertainment provided at the 25th Annual Concours d' Elegance Car Show held on October 2, 2011 at the Columbia Crest Winery in Paterson WA. Hosted by the Pacific Northwest Mustang Club. It is among one of the best cars shows held in region. 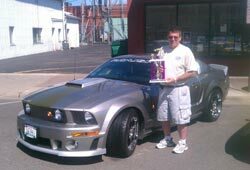 Mark attended this show and took 3rd place in the Roush Specialty Class (P51s, Trac-Packs, Black Jacks, etc). Due to the 5th Annual NW Roush Owners GTG, completion was steep! The other Roush P51 took 2nd, and a Roush Black Jack took first. This was a very nice car show with more than 200 cars. However, the weather was not cooperative. It was raining when I got up, raining in the morning, then some sun mid-morning, but it was pretty much wind and rain after 11 AM. At times the rain coming down hard!. But, over a nice Mustang show in a nice park setting. I’ve never seen so many Roush’s together, much let watching the people watch us as the Pony Trails Poker Run would around Lacy, Olympia, Tumwater and then all the way out to Aberdeen where 5 Star Ford hosted a nice BBQ for us. 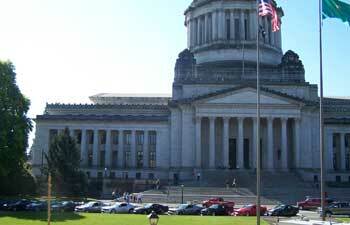 The run included a photo op at the State Capital. Plus, there was some twisty windy back county roads where the ponies got to stretch there legs a bit… not too much, but enough to hear a few superchargers wind up. 2011 American Legion Post #133 Open Car Show September 10th. "Show 'n Shine"
Club members that attended were: Fred, Richard and Jeff. Fred and Richard took home a "Best in Class" Trophy. © 2011-2018 Sun Country Mustang Club, Yakima, Washington / The Ford Oval, the Ford Mustang Running Pony, and the Ford Mustang are registered trademarks of the Ford Motor Company.